I had the chance to visit Manila, the capital city of Philippines for a short trip, and oh my, it was such a fabulous experience. Other than the terrible traffic, I love everything about the country. The Filipinos are super friendly hosts, the country has a very rich history and culture, and most importantly, the food – oh my god – the food. This is a country where the people eat a lot (in a good way); the food is flavourful and very tasty. There is not a proper definition of Philippine cuisine as it differs from the various cities and provinces. But from what I have observed, Filipinos really love their rice and pork. It is impossible to describe my four days three night experience in Philippines within a single post, but here are 10 things to do in Manila Philippines. When I told my friends that I went to Philippines, their first question was: “did you eat the balut?” For the uninitiated, balut is a fertilized duck egg with a nearly-developed embryo inside that is boiled and eaten in the shell. It certainly ranks right at the top of the list of exotic food in Philippines. Nobody was expecting me to try it. But I wanted to experience and see what it is really like. Everyone was crowding around to watch me eat the “supposedly-dangerous” food, which has been over-exaggerated by the Western media. My friend cracked the shell and I took it with my trembling hands. Time really stood still at that moment. My first bite tasted like a normal egg, then my mouth came into contact with the eerily soft bones, and it was followed by the feathers of the embryo. Actually, it was not that bad. I mean, if you do not think of the bones, the feathers, and the fact that there is a nearly developed embryo inside — it is really not that disgusting. If I had to choose again, I would still try it. How about you? 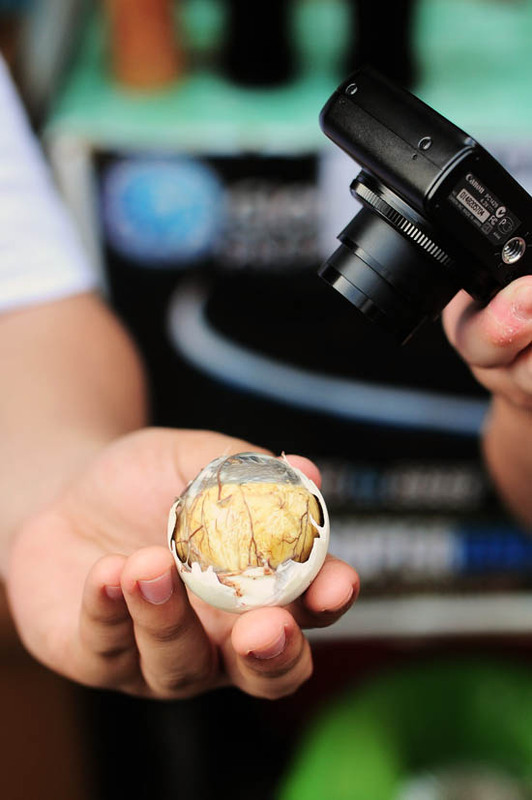 Would you dare to try the Balut? I specifically requested my friends not to bring me to any fine dining restaurants as I wanted to eat what the locals eat. I wanted to be out in the street and try all the Filipino street food. After having the balut, I could eat anything. I went on to try pork intestines, pig’s blood, pig’s ear and chicken intestines. 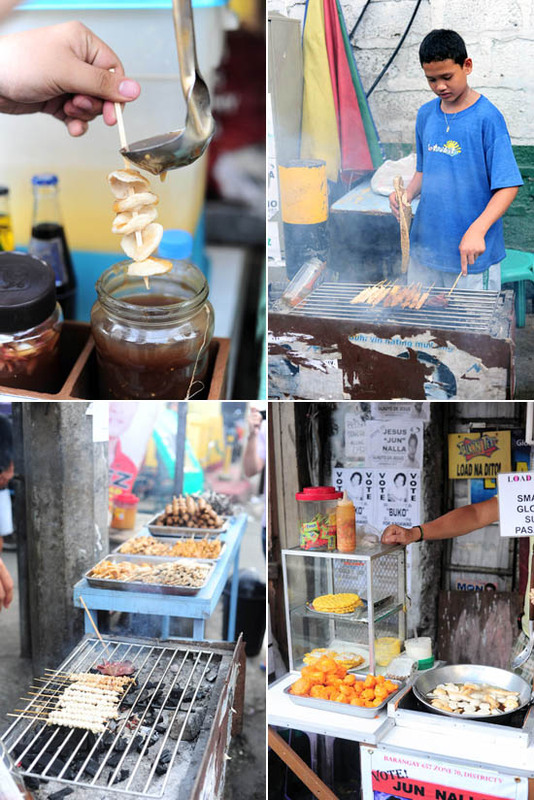 Of course, Filipino street food is not just about raw egg and intestines. They also have fried banana fritter, which is similar to our pisang goreng – only that it is coated with lots of sugar. Apparently, fried fish balls are also popular. It is very different from the ones we have in Singapore. Our fish balls are bouncy and meat, whereas the ones in Philippines are hollow and rather empty inside. Not that I’m a fan of fish ball anyway. SM Mall of Asia (MOA) is big huge gigantic massive! Here is a brief background information: MOA is the 3rd largest shopping mall in Asia, and the 4th largest shopping mall in the world. It’s about three times the size of Vivocity, the largest shopping mall in Singapore. How do you finish shopping at such a massive mall in a day? You don’t. Another shopping area which is popular with the locals will be Greenhills Shopping Center. To put things into better perspective, Greenhills is like Singapore’s Bugis village, Mustafa and Sim Lim Square combined into one. You can also go to V Mall and Shoppesville, where you can get anything, and everything there. For shopping in Philippines, there is also Greenbelt. Do not be mistaken by the name, Greenbelt at Ayala Center (Makati City) is a completely different place from Greenhills Shopping Center. In total, there are five buildings: Greenbelt 1 to 5, with 5 being the newest (opened back in 2007). Greenbelt has a very good mix of high end retail shops, where you can find your Prada and Gucci, to the mid-ranged brands, restaurants, leisure and entertainment. 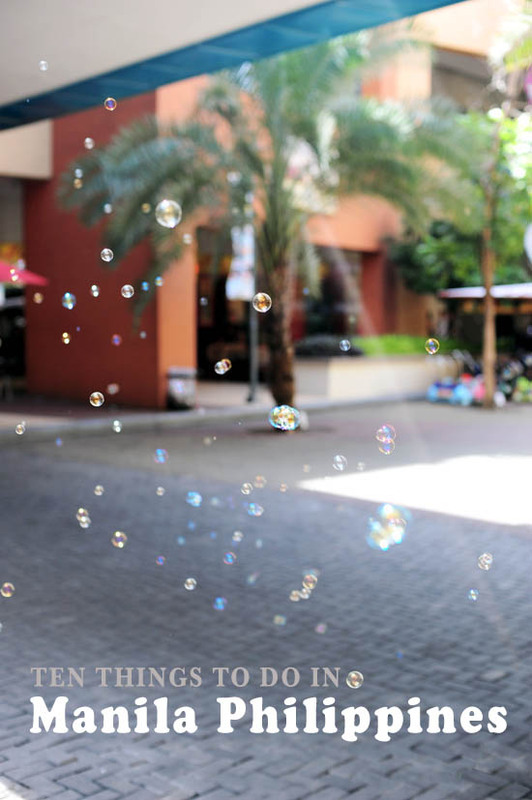 I fell in love with Bonifacio High Street the minute we got there. It is a very chic and happening place with a good mix of retail shops and dining establishments, making it a popular ‘last-destination’ place where friends meet for a drink, and couples end their day after a date. My body was complaining after a whole day of shopping (& eating), so Carlos brought us for the best spa in Manila Philippines. The service and facilities at The Spa were top-notch. I’m not going to write an in-depth Spa review, but if you ever find yourself needing a good rub, try the Swedish Massage (P810 or SGD$25). Prices are considered pricey for local standards, but it is one of the high-end Spas in the city, and it is definitely worth every cent. It was a 30 minute drive on a Sunday (with considerably lighter traffic) from Makati to Intramuros. The name itself literally means “within the walls”, and it’s a fortress built by the Spaniards in the 16th Century. It is a charming old place where you get to see lots of old historical buildings with Spanish influence. 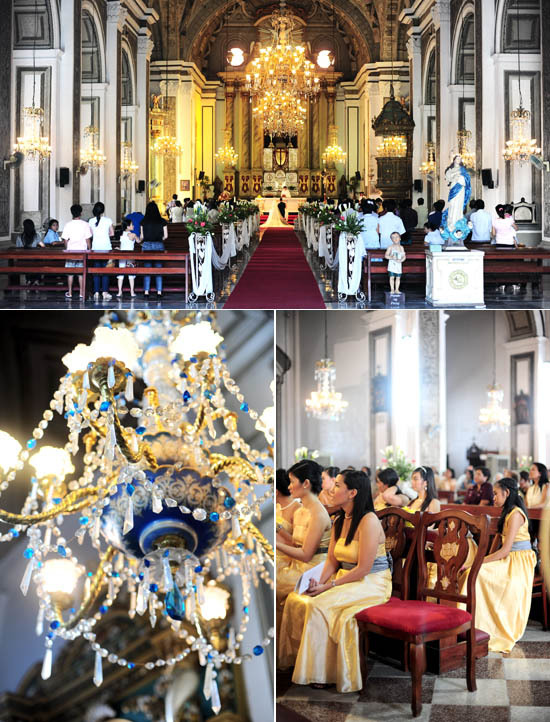 Find Peace in San Agustin, the oldest church in the Philippines. Eat, eat, eat, eat, eat, and eat some more. For the 4 days that we were there, the food was simply amazing. We ate, and ate, and ate. We had breakfast, brunch, followed by a heavy lunch, and then some light snacks before having desserts for high tea. And it was snacks again before another heavy dinner, and we continued with even more food before supper. It was food, food, and more food. 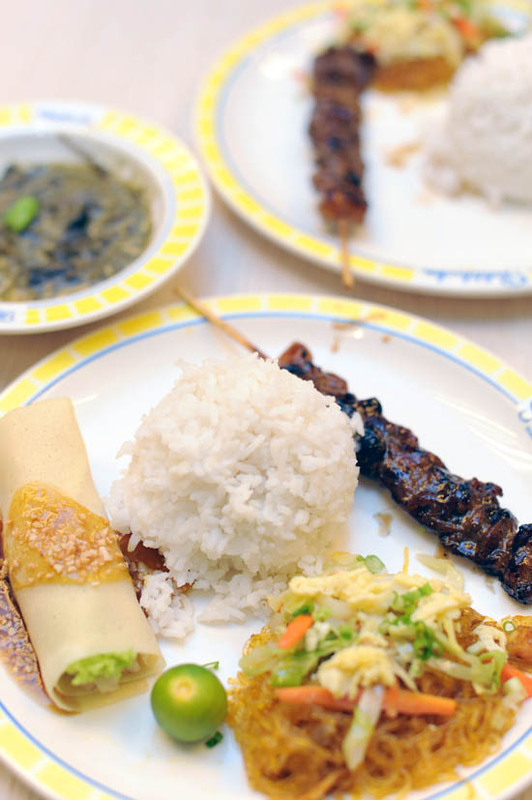 There is simply no word in the dictionary to describe Filipino food. Amazing is an understatement. Lechon manok, lechon liempo and chicken inasal are the authentic Filipino food that the locals eat. They are cheap and affordable, and very tasty. Take my word for it: the thing that you see in the picture right now – they are the best roasted pork in this world. 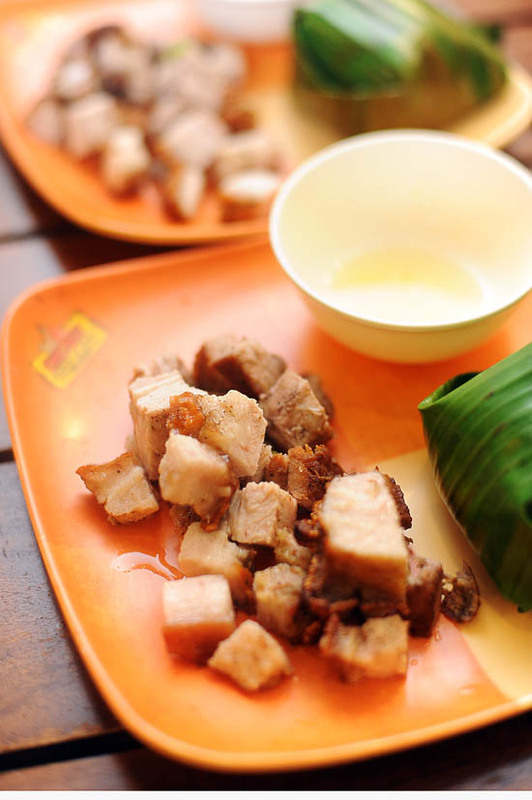 With a bottle of the light San Miguel beer to go along with the greasy but extremely delicious roasted pork, this dinner easily became one of my most memorable meals. Filipinos love pork, Brad loves pork — Brad loves Philippines! The chicken inasal that we had was mind-blowing good. Jt Manukan Grille is like a roadside stall where they grilled the Paa Chicken Thigh (P85 or SGD$2.6) and Pecho Chicken Breast (P88 or SGD$2.75). We also tried Halo-Halo (P85 or SGD$2.6), a popular Filipino dessert that is a mixture of shaved ice and evaporated milk to which are added various boiled sweet beans and fruits, and served in a tall glass. It’s the perfect drink/dessert for a hot day, and somewhat reminded us of chendol. Pancit Luglug (P85 or SGD$2.6) is another Filipino comfort food which consisted of thick round rice noodle topped with ingredients like shrimp, and hard boiled egg. Tsumura Sushi Bar & Restaurant is one of the best Japanese restaurants in Manila. It is located in Makati City, the major financial and business center of Philippines. The set lunches are very reasonably priced, and there’s an additional 20% discount for them during weekends. I had the Ebi & Katsu curry set (P490 or SGD$15), which was absolutely a steal for the price. The Teppanyaki lunch set (P650 or SGD$20) was also well-received, and so was the huge portion of the Sukiyaki lunch set (P800 or SGD$25). Great Japanese food at very reasonable prices, Tsumara restaurant is definitely one of the must-try Japanese restaurants in Manila. Goldilocks is a traditional bakery which has branches all over Philippines. Their outlets are like a combination of bakery and fast food restaurant, serving both cakes, pastries as well as affordable Filipino cuisine. Remember to buy their famous brownies back as gifts. I swear I am usually not like this, but I actually went gaga when I saw Krispy Kreme. The irony? I don’t normally have donuts in Singapore. But I had an Krispy Kreme original donut in Sydney, and it was so good. With a bottle of A&W Cream Soda and one (only one) Krispy Kreme original donut — this is the best thing you can have, before lunch. “Is there a bubble tea craze in Manila too?” I asked out of curiosity. Carlos proudly declared that Serenitea is the best bubble tea in Philippines. If you are craving for bubble tea during your vacation there — you know where to go! From what I understand of the word ‘Dampa‘, it basically means a hut, and it is like a wet market food place. Picture this: once you step into the area, there are many stalls selling fresh seafood, and you need to buy from them before heading to the rows of seafood restaurants which are just located right beside the market. We went to the Seafood Paluto Restaurants, which is along Macapagal Avenue in Pasay City, a few minutes drive from Mall of Asia. It was quite an experience to buy seafood from the wet market as all the sellers tried their best to convince us to buy from their stall. Between the five of us, we had 1 kg of calamari, half a kilo of big prawns, 2 lobster, and a huge slab of tuna belly. Do you have any idea how much food that is? It can probably feed more than 10 people! Even though we tried out best, we couldn’t finish all the food. But we didn’t waste any of them as we took home the leftovers. We paid around SGD150 for the seafood ingredients and the cooking fee. Philippines is such an amazing country and there are simply so much to share with you. My post on the 10 things to do in Manila Philippines definitely does not do justice to this beautiful country; please book a ticket and fly over to experience it for yourself. Come back to the Philippines! The restaurant scene is changing here extremely fast and we’ll be happy to have you here in our sunny country. Thank you for your wonderful review of Manila’s food scene and your kind words about Filipino hospitality, My family & I moved here in Singapore last 2012 and we miss home, food included. My daughter and I stumbled upon your website a few weeks upon arrival and would often go to your site for recommendations. It has been a great journey exploring places you have reviewed. My daughter has been documenting our trips by taking photographs of the food and the places we go to. Much like a Mother-Daughter diary that we can look back on years from now. There are a lot more places to explore in the Philippines. Each region offers something unique that you & your lovely wife will surely enjoy????. Don’t you afraid of getting fat after all that food eating? Definitely cannot get away from becoming fatter after all those food splurging! This is so helpful! We had thought about if we should spend time in Manila or not when we go to the Philippines, but your photos have me convinced to try it out! I’m a huge fan of street food, so there are some things I’ve got to try!! hi, where would your recommended place of stay in Manila? Lets say I would prefer it to be near Mall of Asia. Thank you so much for providing a decent information. Me and my husband are planning to visit Philippines soon.. All this gonna just go into our Itenery! You should come by in the Philippines when there are fiestas. I don’t know if it is still being practiced but before in other regions when there are fiestas some people will just let their doors open and you can come and eat even though you’re a stranger. My mom told me that before in Lucban, Quezon when Pahiyas festival, where houses are decorated with kiping in celebration of the harvest and a contest for the best house is being held, is being celebrated you can do that but nowadays I’m not sure. i must disagree with you, maybe you like Manila just because you didn’t see the rest of Philippines. I spend there 2 times a week in my 4 times 3-week trips to Philippines and i don’t want to go there anymore. It is true most people are friendly but the rest is just a dirty overcrowded , overtrafficed big city. I prefer the countryside much more like Surigao, Bohol, the island of Cebu, Palawan, the northern part of Luzon. Great foods, amazing scenery and nature, super friendly people. I recommend you to go to those parts of Philippines next time you visit.